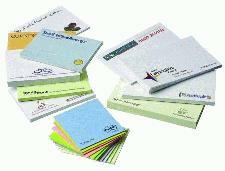 Why not promote your company details this year on our Imprinted Post-it notes from C L Promotions. Our Imprinted Post-it notes are an excellent way for you to advertise your business details and company logo this year at a very reasonable cost. Choose which design and colours you prefer and we'll see that they all get printed with your company details and logo or a personal message. Then give them away to your friends and customers to keep yourself promoted. To find out more about our Imprinted Post-it notes click here and fill in the contact form and we'll be in touch. Other promotional and personalised items besides our Imprinted Post-it notes click here to view our entire range.